Vietnam... a war with a rock ‘n’ roll soundtrack. But there’s so much more to that soundtrack than most of us realize. 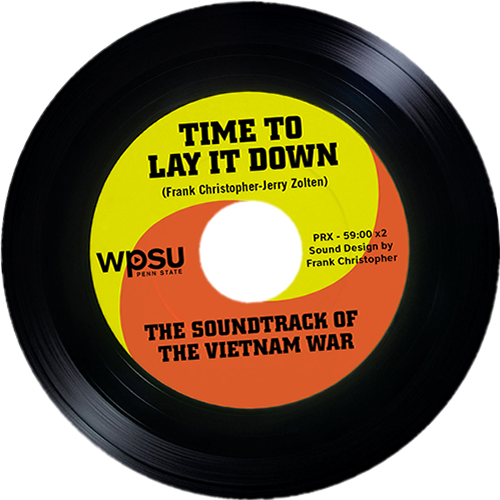 Time to Lay It Down ~ The Soundtrack of the Vietnam War is a two-part audio documentary that explores the music that expressed the deep divisions about the war in American society, and provided a life line for GIs in Vietnam, as well as a source of healing when they came home. Explores the complex soundtrack of the Vietnam war as it played out at home, and takes listeners on a musical journey that begins when few Americans had even heard of Vietnam, to a time further down the road when music exposed the fractures that divided the country. Presents the soundtrack of the Vietnam War as it was heard in Vietnam, a discordant mix of radio broadcasts, bootleg music, and songs created and sung by Americans and Vietnamese, all against a backdrop of terrifying combat sounds, clashing with voices from the American government promising victory.